Jaynie 698 is a beautiful and famous cow with a famous pedigree. 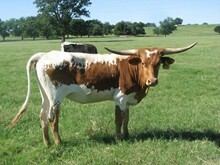 Her daughter MS Grand Jaynie is a "Longhorn Factory" within herself. When the Valentines decided to sell this cow, I made up my mind that day to own her. We love everything about Jaynie 698. She is perhaps the Grand dam of the most productive cow family we own. We have 5 generations on the ranch going back to Jaynie 698. No cow has influenced our herd as much as this lady. She is 18 years old and has just done another great job raising a calf, as we just weaned a 2017 bull calf from her. She is bred to WS Vindicator for what promises to be her best work yet. Jaynie will pass away one day on our ranch and go to cow heaven, if there is such a place. We will save her horns, as a reminder or what makes this longhorn business so enjoyable and satisfying.